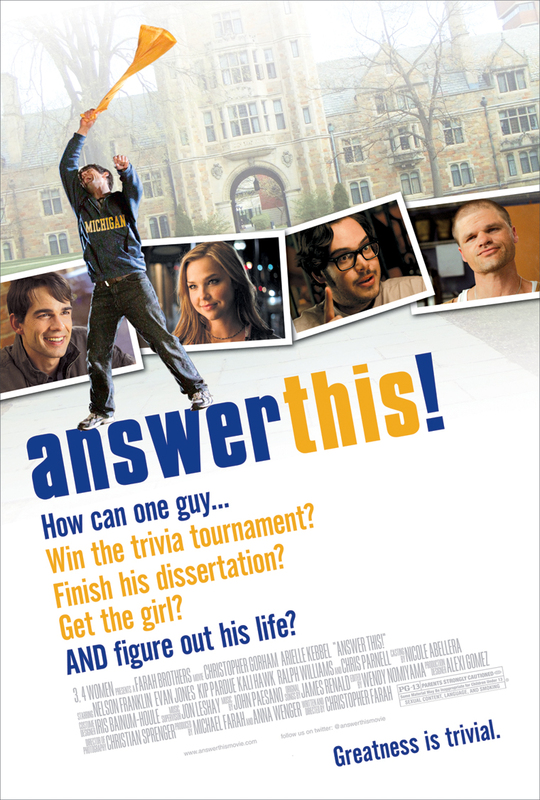 On its surface, a competitive trivia contest seems like the sort of “sport” where a nerd would crush the competition. Unfortunately, there’s always that pesky sports category. 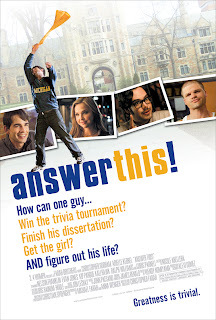 That's the problem facing Michigan grad student Paul Tarson (Christopher Gorham) and his friend James (Nelson Franklin) when they decide to enter a statewide Pub Trivia competition emceed by SNL alumni Chris Parnell. That issue is easily resolved by recruiting the one jock Paul is on semi-friendly terms with, the intense and eccentric “Ice” (Evan Jones), to round out the team. If only all of Paul's problems were so easy to fix. Paul has more or less been coasting through life on a track predetermined by his college professor father Dr. Elliot Tarson (Ralph Williams), whose specialty is teaching a class on the Bible as literature. Father expects son to follow in his footsteps, but with his dissertation due soon, Paul can't seem to get past a bad case of writer's block. There's also that nagging feeling that he may not be meant for a career in academia. Maybe a fling with cute free-spirited freshman Naomi (Arielle Kebbel) will help Paul get his life sorted out. Half a more subdued version of oddball sports comedies like DODGEBALL or BLADES OF GLORY, half coming of age story, the two parts of ANSWER this! don't entirely mesh together. It doesn't help that both storylines hit every beat you'd expect exactly when and how you'd expect them to. Paul is a reasonably likeable and believable character, but he's surrounded by one dimensional caricatures. The excellent cast makes the most of these generic parts, but in the end they only serve the function of nudging Paul along a path just as carefully mapped out and fated as his life seems to be. All of which is too bad, because one gets the sense that writer/director Chris Farrah has a personal connection to at least some of this material that's undermined by trying to shoehorn it into an all too typical Hollywood plot. Farrah does at least prove he has the necessary skills to helm a professional looking feature, and the comedy side of the film does deliver some scattered laughs. The coming of age/romance aspect of the film never felt like anything but a movie script to me, though. ANSWER THIS! isn't a bad movie, but it's way too familiar, contrived and artificial-tasting to truly win me over. 2 1/2 out of 4 stars.